برزگری, قدرت, ارومیه ای, علی. (1391). ارزیابی سایندگی خاک‌ها در حفاری مکانیزه تونل‌های شهری با نگرشی ویژه به خط یک قطار شهری تبریز. نشریه انجمن زمین شناسی مهندسی ایران, 5(شماره 1 و 2), 41-58. قدرت برزگری; علی ارومیه ای. "ارزیابی سایندگی خاک‌ها در حفاری مکانیزه تونل‌های شهری با نگرشی ویژه به خط یک قطار شهری تبریز". نشریه انجمن زمین شناسی مهندسی ایران, 5, شماره 1 و 2, 1391, 41-58. برزگری, قدرت, ارومیه ای, علی. (1391). 'ارزیابی سایندگی خاک‌ها در حفاری مکانیزه تونل‌های شهری با نگرشی ویژه به خط یک قطار شهری تبریز', نشریه انجمن زمین شناسی مهندسی ایران, 5(شماره 1 و 2), pp. 41-58. برزگری, قدرت, ارومیه ای, علی. ارزیابی سایندگی خاک‌ها در حفاری مکانیزه تونل‌های شهری با نگرشی ویژه به خط یک قطار شهری تبریز. نشریه انجمن زمین شناسی مهندسی ایران, 1391; 5(شماره 1 و 2): 41-58. یکی از عوامل مهم در حفاری مکانیزه تونل‌ها‌ی خاکی، اثر سایندگی خاک‌ها و سنگ‌دانه‌ها بر روی ابزارهای برشی و سایر قسمت‌های کله‌حفار می‌باشد. روش‌های متعددی برای اندازه‌گیری درجه سایندگی سنگ‌ها وجود دارد ولی در مورد خاک روش‌های تعیین سایندگی محدودتر است. وجود این محدودیت در ارزیابی مناسب درجه سایندگی خاک‌ها، یکی از چالش‌های علم زمین‌شناسی مهندسی در صنعت حفاری و تونل‌سازی مکانیزه می‌باشد. لذا لازم است با انجام آزمایش‌های آزمایشگاهی و استفاده از اطلاعات موجود و عملی نسبت به بررسی این موضوع اقدام شود. در این مقاله با انجام آزمون‌های مختلف LCPCبه بررسی تأثیر برخی از پارامترهای مهم و مؤثر در سایندگی خاک‌ها (دانه‌بندی، درصد کوارتز معادل و درصد رطوبت) پرداخته شده و سپس وضعیت خاک مسیر خط یک متروی تبریز از لحاظ سایندگی ارزیابی شده است. نتایج این تحقیقات نشان داده با افزایش اندازه­ی دانه‌های خاک، میزان سایندگی افزایش می‌یابد. تأثیر درصد رطوبت در همه نمونه‌های مورد آزمایش یکسان نبوده، در تعدادی باعث افزایش و در تعدادی باعث کاهش میزان سایندگی می‌شود. بررسی تأثیر درصد کوارتز معادل در میزان سایندگی خاک نشان داد که با افزایش این پارامتر، بسته به اندازه دانه‌های خاک، میزان سایندگی به صورت توانی افزایش می‌یاید. بررسی میزان سایندگی خاک مسیر خط یک متروی تبریز، نشان داد خاک مذکور در حالت خشک، خیلی ساینده و در حالت اشباع در حد متوسط سایندگی است. Soil abrasivity and TBM component wear issues is one of the most important factor in success of this type of projects. Despite of rocks there are very few test methods to describe the abrasive characteristic of soils. It can be mentioned that impossibility of reliable estimation of soil abrasivity on mechanical tunneling is one of the engineering geology science gaps in tunneling and drilling industry. In this paper the influence of some important parameter on soil abrasivity (soil particle size, equivalent quartz content and water content) are studied by use of LCPC standard and the abrasiveness of Tabriz metro line 1 soil are estimated. The results indicate by increasing of soil particle size the abrasivity trend to be increased. The influence of water content on abrasivity was not the same in all of the samples. The presence of water in some samples cause to increase and in the other sample cause to decrease of abrasivity. With increasing the equivalent quartz content (EQC), the abrasivity of soil depends on grain size has trend to increase with power relation. Evaluation of Tabriz metro line 1 soil samples shown it is very abrasive and medium abrasive in dry and saturated condition respectively. درویش زاده، ع.، 1370. زمین‌شناسی ایران، انتشارات امیرکبیر. سازمان زمین‌شناسی و اکتشافات معدنی کشور، 1372. نقشه زمین‌شناسی تبریز 1:100000، تهران. سازمان قطار شهری تبریز، 1383. گزارش­های ژئوتکنیکی مسیر تونل خط یک، تبریز. سازمان قطار شهری تبریز، 1388. گزارش­های زمین‌شناسی فاز اجرا. معماریان، ح.، 1385. زمین‌شناسی برای مهندسین، انتشارات دانشگاه تهران. Alavi Gharahbagh, E., Rostami, J., Palomino, A.M., 2011. New soil abrasion testing method for soft ground tunneling applications. Tunnelling and Underground Space Technology, 26: 604–613. Dahl, F., Bruland, A., Jakobsen, P.D., Nilsen, B., Grov, E., 2012. Classifications of properties influencing the drillability of rocks, based on the NTNU/SINTEF test method. Tunnelling and Underground Space Technology, 28: 150-158. Langmaack, L., Grothen, B., Jakobsen, P.D., 2010. Anti-wear and anti-dust solutions for hard rock TBMs, Proceedings of World Tunneling Conference, Vancouver, Canada. Lien, R., 1961. An indirect test method for estimating the drillability of rocks. PhD thesis, NTH Department of Geology, 90p. Nilsen B., Dahl, F., Holzhauser, J. and Raleigh, P., 2007. New test methodology for estimating the abrasiveness of soils for TBM tunneling. Rapid excavation and tunneling conference, pp. 104-116. Nilsen, B., Dahl, F., Holzhäuser, J., Raleigh, P., 2006b. Abrasivity testing for rock and soils. Tunnels and Tunneling International, 47–49. Nilsen, B., Dahl, F., Holzhäuser, J., Raleigh, P., 2006c. SAT: NTNU’s new soil abrasion test. Tunnels and Tunneling International, 5: 43–45. Nilsen, B., Dahl, F., Holzhäuser, J., Raleigh, P., 2006a. Abrasivity of soils in TBM tunneling. Tunnels and Tunneling International, 36–38. 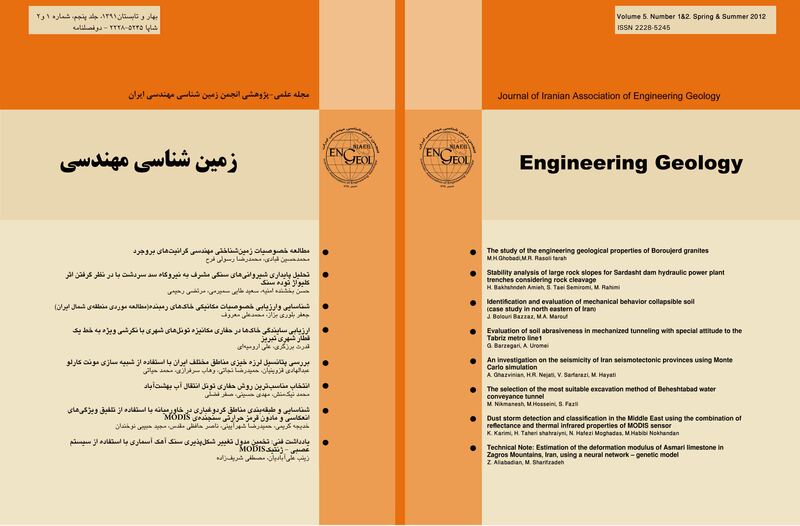 Rostami, J., Alavi Gharabagh, E., Palomino, A.M., Mosleh, M., 2012. Development of soil abrasivity testing for soft ground tunneling using shield machines. Tunnelling and Underground Space Technology, 28: 245–256. Plinninger, R., Kasling, H., Thuro, K. and Spaun, G., 2003. Testing onditions and geomechanical properties influencing the CERCHAR abrasiveness index (CAI) value, International Journal of Rock Mechanics and Mining Sciences, 40: 259-263. Plinninger, R.J., Käsling, H., Thuro, K. 2003. Wear Prediction in Hard rock Excavation Using the Cerchar Abrasiveness Index (CAI, EUROCK 2004 & 53rd Geomechanics Colloquium. Schubert. Thuro, K., Singer, J., Käsling, H., Bauer, M., 2006. Soil abrasiveness assessment using the LCPC testing device. Felsbau, 24: 37–45. Thuro, K., Käsling, H., 2009. Classification of the abrasiveness of soil and rock / Klassifikation der Abrasivität von Boden und Fels. Geomechanics and Tunneling, 2 (2): 179–188. Thuro, K., Käsling, H., 2003. Hard rock tunnel boring, cutting, drilling and blasting: rock parameters for excavatability, ISRM, Technology roadmap for rock mechanics, South African Institute of Mining and Metallurgy, pp. 1227-1233.